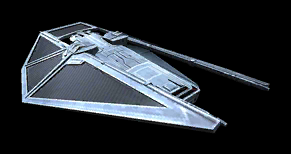 Description: The TIE Reaper was a TIE line starfighter manufactured by Sienar Fleet Systems, and used by the Galactic Empire as a troop transport. The fighter featured flat, pointed, horizontal wings; similar in design to the TIE striker�a streamlined TIE variant specialized for in-atmosphere missions. At least one transport was present in the Ring of Kafrene during Rebel Captain Cassian Andor's mission to the asteroid belt in 0 BBY. Another TIE Reaper was notably used during the Battle of Scarif to insert Director Orson Krennic's guard squadron of death troopers into battle to defeat Rogue One�a squad of Rebel soldiers that took it upon themselves to steal the plans to the Death Star, the Empire's planet killer superweapon. In order to ensure the TIE Reaper could successfully insert the squad, it was escorted by a flight of TIE strikers. Around 34 years later, in 34 ABY, a criminal organization called the Ranc gang had TIE Reapers under their command on the planet Kaddak.